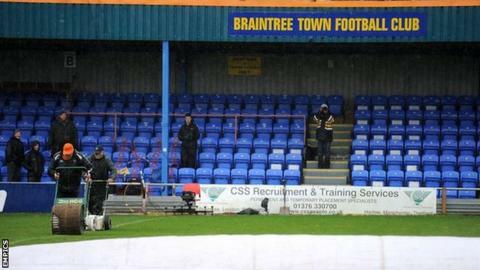 Bristol Rovers are to investigate an incident which occurred between their supporters and a Braintree player in their 2-0 defeat on Saturday. Tempers flared after a penalty was awarded to the Essex hosts for an off-the-ball incident between Rovers defender Tom Parkes and opposition striker Jordan Cox. Players then bundled into the net and an away fan appeared to confront Cox. A Rovers statement said the club take the issue "very seriously". It read: "We will be investigating the incident that occurred at yesterday's game between supporters and an opposition player. "While we understand that feelings are running high at the moment, there can be no excuse for this sort of behaviour, and we do not want people like this associated with Bristol Rovers. "We take issues like this very seriously, and we will take appropriate action on completion of the investigation." Essex Police say no complaint was made with regard to the alleged incident and no arrests were made at the match. The resulting penalty was converted by Kenny Davis in the 31st minute and Braintree doubled their lead in the second half through Dan Sparkes, inflicting a third defeat of the season on the Pirates. Prior to their relegation from the Football League in May, Bristol Rovers were reported to the Football Association after pitch invasions occurred in their win at Wycombe.